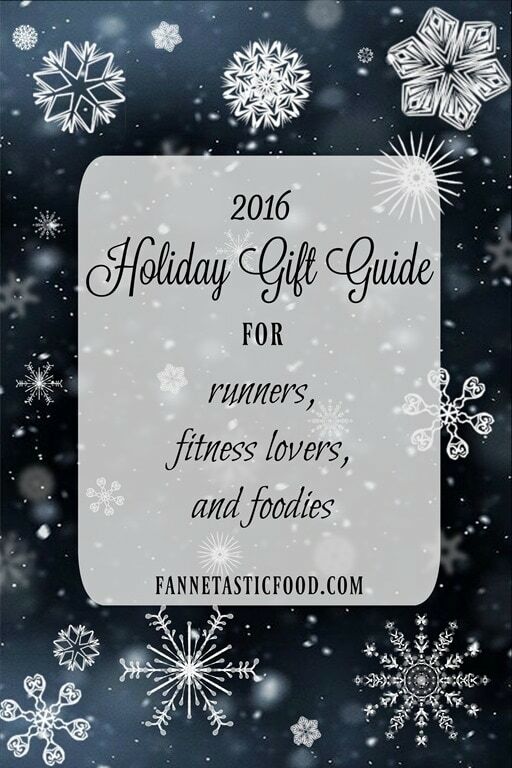 Shameless self plug: a copy of my Nutrition for Runners program! Nutrition for Runners is a comprehensive nutrition and training program for runners. In addition to meal guides, expert interviews, and a full recipe cookbook, it also includes a library of training plans (from my co-author, a running coach) designed for either performance or weight loss. A race bib/medal holder. I have one in my office at home and love it! This combination bib/medal holder is especially cute for women, and I love this inspirational medal holder too. Here is a more manly option for guys. A commemorative race print. A company called Run Ink Design creates a custom frame-able race map that includes your runner’s finish time, bib number, and race date. Cool! Reflective gear. Keep your favorite runner safe while they run in the dark! Here’s a great headlamp for running and you might also consider getting them a reflective vest. Winter running accessories. If your favorite runner lives in a climate that involves lots of running on ice or snow, runner-friendly YaxTrax (little grips that fit onto your running shoes) are a must. Also, warm gloves (I like the Drift mitten gloves) and running hats (check out this nice running beanie or this running ear warmer) are always welcomed. A GPS watch. I have both the Garmin 225 and the Garmin 910xt – you can read my review/comparison of them in this post. For a cheaper but very well reviewed option, check out the Garmin Forerunner 10. Compression wear. I like CEP compression and Champion CSX. I wear compression socks around the house after runs, and sleeves during long runs when the weather isn’t too hot. They’ve really helped me with shin splint/calf tightness issues. Another option specifically for ankle/plantar fasciitis issues is these compression foot/ankle sleeves. A running belt or hydration pack. I’ve had a SPIbelt for years – I wear it on shorter runs when I don’t have my water vest along for the ride and want to carry my phone. And speaking of water vests, the Nathan hydration vest is amazing for long distance runners (or hikers, or bikers). Headphones that stay put. Matt and I love these headphones – cheap and the only ones we’ve found that don’t fall out while running! Also – these cord tacos are genius if you don’t want your headphones to get tangled in your gym bag or purse. A yoga mat. This Jade Yoga Mat is my absolute favorite. Not slippery at all! And while you’re at it, a yoga mat sling or yoga mat bag are also useful! If you want a good gift for someone who does a lot of hot/heated yoga, consider a yoga towel – I have and love this yoga towel. Box of assorted cooking/food goodies: For the guy in your life, Mantry sounds awesome. This foodie gift box (spices/cooking stuff) is affordable and sounds fabulous, or class it up with the gourmet coffee sampler. An espresso/coffee machine. We have the Nespresso Pixie Espresso Maker and it’s my favorite thing in our kitchen. Another thing 100% worth the splurge is the Nespresso Aeroccino Plus milk foamer. It warms AND foams your milk (or you can have it just foam and keep the milk cold). We also have the Nifty Nespresso Carousel, which holds our capsules. I also recommend the Keurig Home Brewing System – this is Matt’s favorite thing in our kitchen! It’s super simple to use and makes great (and quick) coffee and tea! You can also buy a reusable K-cup so you can use your own loose leaf tea or ground coffee. If you already have a Keurig, a K-cup carousel is a fun addition. Tools that make cooking easier. Some recs for things we use all the time: a garlic press, an oil mister, silicone baking mats (no stick! ), a knife sharpener, an egg slicer, a peeler, a zester/grater. We also really love GIR products – check out this GIR spoon set, GIR spatula and flipper set, and GIR microwave/oven safe suction lids. A Stitch Fix gift card! It’s actually available for guys now too! The greatest slippers of all time – I have two pairs and literally never take them off. If I am home, these are on my feet. For DC area readers: check out District Line Co., which makes fun local t-shirts and tanks (and onesies)! I have the Arlington tank and love it. Such great gift ideas! I love the medal holder! All of mine are just sitting in a pretty little box at the moment but I would love to be able to display them. I’ll have to send through a very pointed hint to the fiance about something I’d like to find under the tree…. As for my wishlist, I am a huge book nerd so I’ve got a few deliciously dense historical texts that I’ve asked for – I can’t wait!!! You might add bands, with handles, of different colors for various strength and flexibility exercises! Great ideas!! :D Also for a foodie? I always love getting like fancy pastas, dry soup mixes, spices etc to add to my collections! Home Goods always has such random and great stuff like that for so cheap! Oooo GREAT idea! That’s a fun homemade gift too (the dry soup or baking mix)! I love that you combined your guide into 1, I broke mine up into sections and kind of wishing I didn’t. So many of us are into multiple things running, cooking, yoga etc ! Just in time for the Holidays! So thankful I was able to come across your post Anne! As a foodie myself, I was really looking for some gift ideas … for me and of course for my friends and colleagues! I am a fan of preparing easy and healthy meals I must say that this is the post I have been searching for. Keep on writing tips!